Dream Pod 9: Utopia Kickstarter Update: Commando Armiger, Recce & Support Drones Mold Insert Plates 3d Models Preview! We received the final three of the Utopia robot mold insert plate 3d models to approve this week. You can checkout the preview image below of the Commando Armiger, Recce & Support Drones mold plates. Now production can get started on the plastic injection mold. In about a month it should be done, then test pops of plastic sprues will be made and sent to us to approve the mold or note any fixes that are needed. Once the Utopia models mold and the Peace River & NuCoal models molds are finished and approved they will all be shipped at the same time to Canada, for the final plastics production. 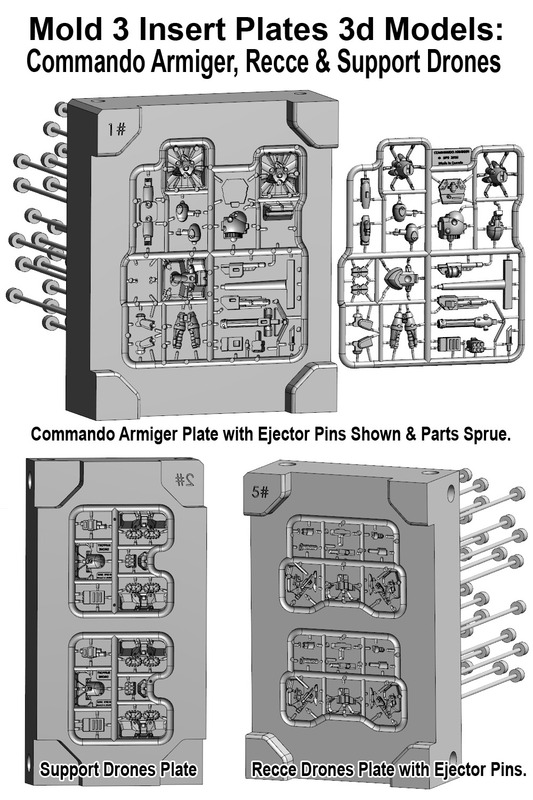 Home › Blogs › Robert Dubois's blog › Utopia Kickstarter Update: Commando Armiger, Recce & Support Drones Mold Insert Plates 3d Models Preview!